A bill passed by the Washington state Senate on Friday will phase out the farming of Atlantic Salmon in Washington waters by 2025, and British Columbia First Nations are hoping to see the provincial government do the same. Washington’s governor Jay Inslee has indicated he will sign the bill, which was proposed after tens of thousands of Atlantic salmon escaped from an open net pen fish farm last August. The farm - located near the San Juan Islands - is owned by Cooke Aquaculture, the largest producer of farmed Atlantic salmon in the United States. The company has expressed disappointment in the legislature’s decision, a sentiment echoed by industry advocates in British Columbia. That said, British Columbia’s fish farming industry is vastly different from Washington’s, according to Dunn. Dunn said fewer than 100 fish escape from all farms in British Columbia each year, a number he said has “no impact” on the local environment in the province. Atlantic salmon can’t interbreed with Pacific species, but Chamberlin and others express concern that salmon that escape from farms can spread diseases to wild fish they come in contact with. Chamberlin characterized open net pens - floating fish farms located off the B.C. coast - as “old technology,” which should be replaced with landlocked, closed-containment fish farms in the future. “What we’re doing is not trying to attack an industry, but look after the sacred salmon that are for all of our people in British Columbia, not just First Nations,” he said. 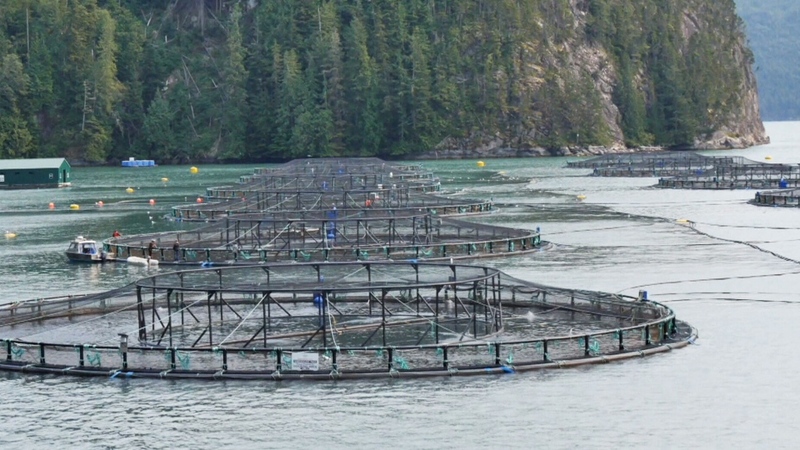 Currently, the vast majority of farmed salmon in British Columbia is farmed in open net pens, and Dunn’s organization cites studies conducted by various governments that have concluded closed-containment fish farms are not yet commercially viable for large scale production. The new Washington law will phase out the farming of Atlantic salmon, but does not prohibit the use of open net pens. Dunn declined to speculate about how Washington’s salmon farming industry would adjust to the new rules, but he said Atlantic salmon are by far the most commonly farmed fish in the world. While some farmers raise species of salmon native to the Pacific Ocean, Dunn said, most of the global demand for salmon is for the Atlantic variety.